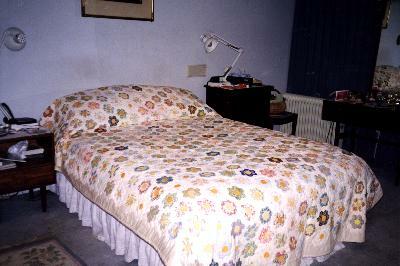 Grandmother's Flower Garden quilt. Hexagons are from cotton and polyester material mostly from 'Reverse Garbage' Melbourne. Hand pieced by Rita Fiddian, the owner. Hand quilted. The padding is wool and the backing cotton. *The women were Robyn Huntington, Jan Hird, Lee White, Pat McClelland, Vicki Fletcher, Faye Eddy and Cath Ringwood.